Roman law has been admired for a long time. Its admirers, in their enthusiasm, have sometimes borrowed ideas from their own time and attributed them to the Romans, thereby filling some gap or fixing some anomaly. Roman private law is a well known victim of this. 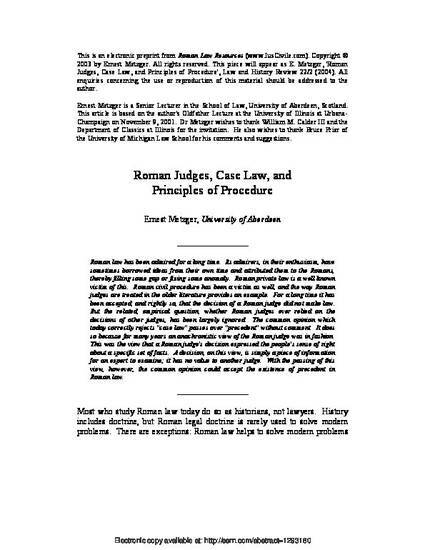 Roman civil procedure has been a victim as well, and the way Roman judges are treated in the older literature provides an example. For a long time it has been accepted, and rightly so, that the decision of a Roman judge did not make law. But the related, empirical question, whether Roman judges ever relied on the decisions of other judges, has been largely ignored. The common opinion which today correctly rejects "case law" passes over "precedent" without comment. It does so because for many years an anachronistic view of the Roman judge was in fashion. This was the view that a Roman judge's decision expressed the people's sense of right about a specific set of facts. A decision, on this view, is simply a piece of information for an expert to examine; it has no value to another judge. With the passing of this view, however, the common opinion could accept the existence of precedent in Roman law. Published as: Law and History Review, 22 (2004), 243-75.